"The real idea with it is to take a family of instruments, such as the mandolin... we have a mandolin which is like a violin, we a have viola, which corresponds to mandola and the cello corresponds to the mandocello. So we had this family. And trying to put it in that same context and explore the great composers and whatever else we can do to sort of expand the sounds that are available." That's Dana Rath. He and Paul Binkley are founding members of the Modern Mandolin Quartet which was formed around 1985. They're two newest players are Adam Roszkiewicz and Matt Flinner. 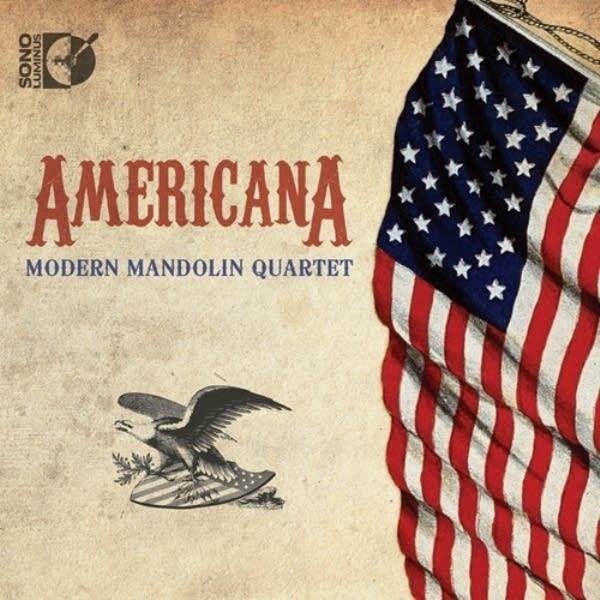 Each member of the Modern Mandolin Quartet is from America, and each plays the American mandolin, so they thought, "Why not release a new recording titled Americana that celebrates American composers?" "And we had all this music that we really wanted to do and we really wanted to do the Dvorak American String Quartet because we just found that it worked so well. These instruments come to life when there's a certain harmonic complexity in the sound that the instruments just fly when we play that kind of music," explains Paul Binkley. "We played it exactly note for note," says Dana, "But that's the one... well, for lack of a hipper word, cool thing about it is that we've spent a lot of time in the past just sitting down and reading through volumes of quartets besides just listening. Sometimes we just actually have to play them in order to find ones that will jump off the page and say, 'Wow, this should have been written for the mandolin.' And once in a while we find that. And I think we found that, at least in our opinion, when we started playing the American String Quartet." "In the first movement, there's a beautiful, lyrical section that pops up something like a minute or two in where it just feels like a spiritual," adds Paul Binkely. "The thing about playing a mandolin if you're going to play violin music — is that violins can use a bow and they can do a crescendo on a long note and they can hold a note as long as they want. And they can play long chords with several members while somebody plays a melody over and creates a beautiful bed of sound and how do you do that on the mandolin? Well, you either choose your music very carefully so that you don't have to do it. Or there is what we call tremolo. You just simply play the string over and over again, very quickly. And this has to be done with a lot of taste because otherwise it doesn't work." "I think when you hear the mandolin quartet, you probably would associate it more with how a piano sounds than you would a string quartet," Dana explains, "Because the plucked instrument just has a natural decay and it's percussive sounding and the piano is a lot like that. And I think because of that, we've found a lot of our music that was originally written for piano because it's maybe less of a leap to interpret." "Yeah, such as the Gershwin Preludes that are also on the album," Paul adds, "They were on an earlier record. That's something John Imholz arranged for us when he was in the group. And they... similarly work very well because they use an interesting harmonic idiom, close to jazz. I mean, basically it is jazz, a lot of 7th chords and interesting rhythms and not very many times when the sound has to be sustained as if violins were bowing long notes. So those are perfect for us." Philip Glass is also featured on this new release, Americana. Paul Binkley says the music for this suite comes from a film about a Japanese writer, actor and political activist, titled Mishima. "But that's not really what attracted us to it. We wanted something more modern, something that didn't come from the early part of 20th century, something that went past that, past the sort of jazz harmony and so on that we used in a lot of our other things. " "But I think also what drew us to this is that it's very contemporary sounding but it gets away from the instrument playing melody all the time," Dana adds, "It's these patterns that repeat that just become hypnotic after awhile. I felt almost dizzy the first time I played it — the first time I played it well, shall I say," he chuckles. There's also a Bill Monroe medley that blends beautifully with all the classical arrangements on Americana. Paul says it was Mike Marshall, another founding member of the ensemble who created this arrangement for the group, "And then I guess that's another reason why we went with the entire American theme for this CD is we had that that we wanted to record. And Matt Flinner took over playing all Mike's parts and of course Matt comes very strongly from that background. And Bill Monroe's music is kind of like chamber music — all the parts are worked out, they all fit together... it felt like a string quartet, when we got everything working together. So it's a lot of fun." Everything about Americana, the seventh and newest recording from the Modern Mandolin Quartet, is a lot of fun.